How Does a Stair lift Accommodate all Body Shapes and Sizes? If you need to install a stair lift in your home or office building and you’re concerned about it being universal for all body types and sizes, not to worry. As long as you choose the right stair lift, you shouldn’t have to worry about weight capacities and body shapes. Keep reading to find out how you can choose a stair lift that will accommodate all body shapes and sizes. Larger, not smaller – The trick is finding a stair lift that can carry everyone. A larger chair can still carry a smaller person, but a small chair can’t carry a larger person. Keep that fact in the back of your mind as you shop. Look for oversized chairs that have a higher weight capacity that are wider than the normal stair lift. While you are doing this, you should also consider the size of the staircase the lift is intended for. If you get a stair lift that is too large, it won’t work with your stairway. So, the bottom line is this, choose a stair lift that is larger with a higher weight capacity, but make sure that it will still work with your staircase. How big is big enough? The answer to this question all depends on where you are using the stair lift. If the lift is being use in a residential location, you can probably get away with something smaller. If you’re installing the stair lift in a commercial building, then the bigger, the better. In a commercial building, you never know who is going to walk through the front door. Regardless of their size or shape, you want all customers, employees, and clients to be able to utilize the lift if they need it. Why Does It Matter? If a handicapped person walks into your business and, because of their size, can’t use the stair lift that you have provided, they could become incredibly embarrassed. This could result in the loss of a sale, client, or potential customer. You want everyone who walks in your door to feel comfortable and welcomed. 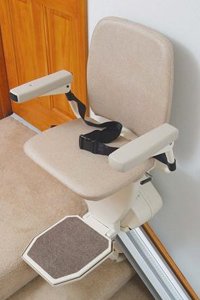 Providing the ample sized stair lift is part of making that experience the best one possible. If you neglect to show sensitivity to persons who cannot fit in a smaller or even “normal” sized stair lift, then expect to lose out!